Gourmet food trucks have made a huge impression in Los Angeles, and now these mobile eateries are beginning to pop up more and more in Hollywood romantic comedies. Beyond just showing up as a prop in romantic comedies, food trucks are becoming an important plot device meant to demonstrate independence, and the pursuit of one’s self. Many romantic comedies have their characters go down a similar path of breaking down, then pursuing their own dreams and eventually reuniting with a significant other after ‘finding themselves’. In (500) Days of Summer Joseph Gordon Levitt’s character quits his job to pursue architecture, and in Bridesmaids Kristen Wiig’s character returns to her love of baking after hitting rock bottom. Now in last weekend’s number one movie, Think like a Man, Michael Eely’s characters recovers from a devastating breakup and wins the beautiful girl in the end by starting his own food truck serving pork. In the upcoming film The Five-Year Engagement, Jason Segel’s character goes through his own transformation by purchasing an ambulance and converting it into a paramedic-themed taco truck. 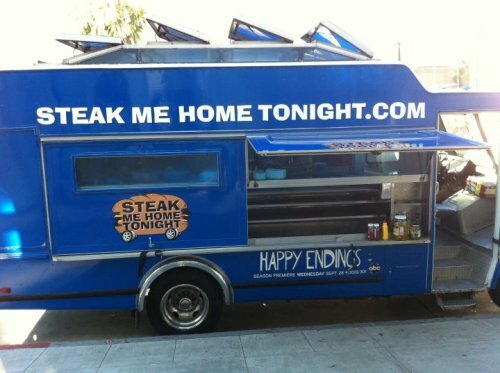 This trend is even seen on television, as Zachary Knighton’s character on Happy Endings recovers from being left at the altar by running his own food truck called Steak Me Home Tonight. Food trucks have come a long way from being regarded as ‘roach coaches’ to being a new Hollywood romantic-comedy staple. Symbolically, food trucks represent much more than just a meal on wheels; they represent independence and come off as a far more masculine form of cooking than working from a kitchen. This way, male leads in romantic comedies that are often very comfortable with their own sexuality can be self-sufficient, serve manly food and still have the ability to drive away at a whim. Critically, food trucks have come a long way in recent years. Now they show up in television dramas such as Gossip Girl and are even frequented by celebrities in everyday life. Last week Eva Longoria-Parker stopped for a cupcake at New York City favorite, Cupcake Crew. Whereas food trucks resembled something much humbler to Hollywood in the past. They are now becoming a crucial plot device in many kinds of film. – I loved the hunger games so a frined recommended reading The Maze Runner it’s another trilogy and they are already starting to make the movies for it I havent read it yet but I trust this frineds opinion in books! Enjoy!